Can you provide a specific example on how to calculate a Noise Threshold. From what I understand, the noise threshold tells you if you have an acceptable signal or not. You take the Noise Margin and add all gains and subtract all losses and come up with the Noise Threshold which should be above 0. 3 DB of antenna gain. 5 DB of loss between the antenna and the TV. What would that noise threshold mean, i.e. if the noise threshold was 50 DB, does that mean I could tolerate an additional 50 DB of noise before my signal became marginal? The Noise Margin, is a measure of how strong a signal is above it's operating threshold. It is a measure of how much signal loss you can tolerate before the signal reaches an unusable state. It's similar to SNR, but it is different in the sense that Noise Margin is relative to the operating requirements of the particular signal in question. For example, ATSC A/53 (our digital TV standard) has a theoretical breaking point around 15.2 dB SNR. That means that the signal needs to be at least 15.2 dB above a "white" noise floor in order to be usable. This represents the 0 dB Noise Margin point. Other technologies operate at different SNR levels. For example, NTSC (our analog TV standard) has a theoretical breaking point around 27 dB SNR ("breaking point" for analog is a subjective and debatable topic, but that's a separate issue). CDMA phone technology can work at negative SNR numbers, and so can GPS. The SNR threshold for each technology can vary. The Noise Margin is always defined relative to that breaking point. Positive Noise Margin signals are usable, negative Noise Margin signals are not. Yes. A Noise Margin of 50 dB means that the signal can be degraded by another 50 dB before it stops working. The tvfool reports give you the starting Noise Margin in-the-air at your location. From there, you can add the gain of your antenna (in dBd, not dBi), and subtract all the other losses in your setup (cable losses, receiver noise figures, splitter losses, impedance mismatch losses, etc.). If your antenna is indoors, then you'd subtract the building losses first, then add your antenna gain, and subtract any losses that occur after that. If you end up with a positive Noise Margin at the end of the chain, then you should have a usable TV signal. In most cases, you actually want to end up with some extra Noise Margin left over (say around 10 dB or more) to help the system cope with random variables (e.g., stormy weather, multipath, seasonal changes, interference, etc.) that might cause your signals to fluctuate. Here is a simple spreadsheet that can be used to estimate Net NM. Feel free to offer feedback... there could be bugs. If so, I'll try to correct them. Thanks for the Net NM Calculator. I had trouble downloading it and using it because its file had a php extension, but it was listed as an xls file in the attachment name. The solution was to change the file extension to xls, and it worked well for me. I used line 7 for the balun loss. One minor criticism; line 15 says Net NF. I think it would more correct to call it Net NM. Andy Lee calls it Net Residual Noise Margin. Here is the System Noise Figure calculation. I used the System Noise Figure calculator by holl_ands and majortom. Last edited by rabbit73; 11-Sep-2017 at 8:26 PM. Andy Lee made a post on the AVS Forum with two very good Noise Margin diagrams, one for an indoor antenna without a preamp and the other for an outdoor antenna with a preamp. You have to log in to see the images in his post, but you should be able to recover the images from the attachments there or here. I added some notes to his diagrams to help me understand the Noise Margin concept when I was learning about it. Last edited by rabbit73; 11-Sep-2017 at 8:33 PM. Here are two Noise Margin diagrams of an indoor antenna without preamp. They are two versions of the same setup. Version 1 is the way Andy shows it with the minimum required SNR added to the thermal noise floor and then the tuner NF is added to that. Version 2 adds the tuner NF to the thermal noise floor and then the minimum required SNR is added to that, showing what goes on between NM 0/-91 dBm and the thermal noise floor at -106 dBm. Note that a signal stronger than NM 0 dB, namely NM +6 dB in this case, is needed at the input of the tuner to offset the 6 dB NF of the tuner. Last edited by rabbit73; 11-Sep-2017 at 10:00 PM. Here is a Noise Margin diagram for an indoor antenna with and without a preamp with moderately strong signals. Note that the preamp not only compensates for distribution losses but also allows reception of weaker signals than without a preamp. In this case the improvement is 5 dB, from a +13 dB NM signal to a +8 dB NM signal. The components of the improvement are preamp elimination of the 3 dB coax loss, 3 dB NF improvement of the preamp NF over the tuner NF, minus the 1 dB coax loss between the antenna and the preamp input. If the tuner NF is more than 6 dB, or the preamp NF is less than 3 dB, or the loss between the antenna and the preamp input is less than 1 dB, then the improvement will be more than 5 dB. 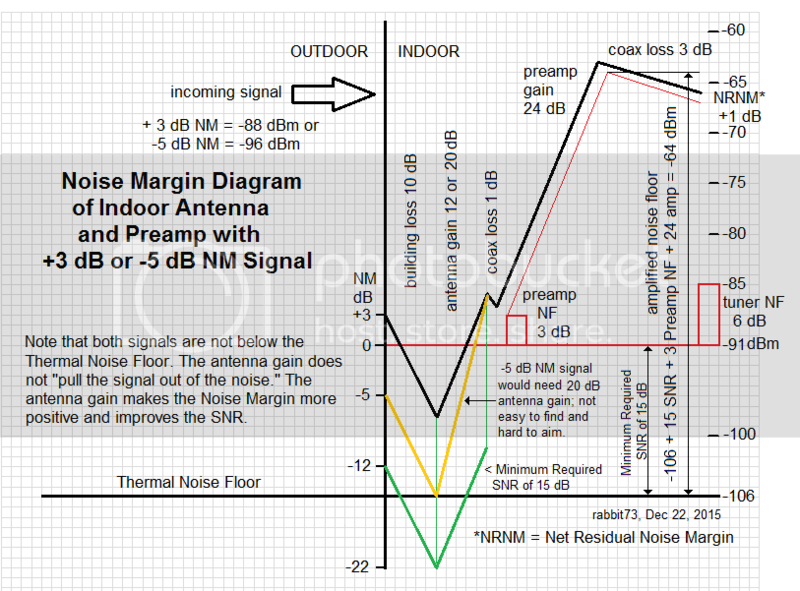 Here is a Noise Margin diagram for an indoor antenna with a preamp and two weak signals. Note that neither signal is below the thermal noise floor. The antenna gain makes the Noise Margin more positive and improves the SNR. Last edited by rabbit73; 11-Sep-2017 at 10:10 PM. Here is a Noise Margin diagram for an outdoor antenna with and without a preamp with weak signals. As with an indoor antenna, the preamp not only compensates for distribution losses but also allows the reception of weaker signals than without a preamp; in this case from -2 dB NM to -7 dB NM. Only antenna gain can improve the NM to the point that the NF of the tuner is exceeded without a preamp or the NF of the preamp is exceeded with a preamp. Last edited by rabbit73; 11-Sep-2017 at 10:13 PM.